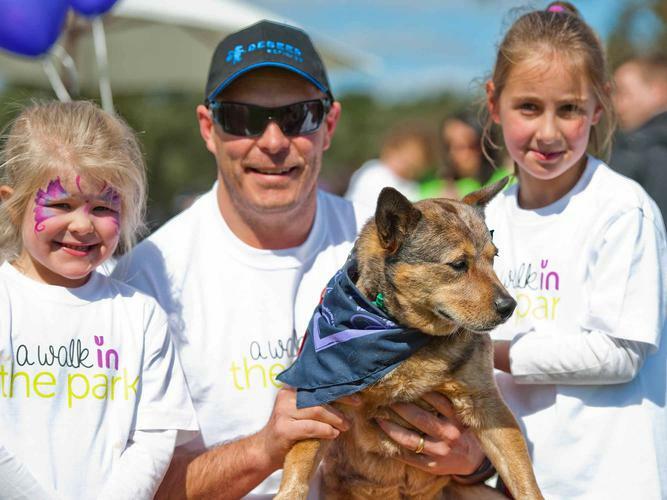 This Sunday, 28 August over 8000 walkers, supporters and even family dogs will be taking a Walk in the Park to raise funds for Parkinson's disease. This Sunday over 8000 walkers, supporters and even family dogs will be taking a Walk in the Park to raise funds for Parkinsons disease. Parkinson’s is a chronic, progressive, neurodegenerative disease that currently has no cure. It has four main movement related symptoms including tremor, muscle rigidity, poverty of movement and loss of posture and lesser-known non-motor symptoms such as depression, anxiety, behavioural disturbance, sleep disorder, dementia and sensory deficits. 700,000 Australians are directly impacted by Parkinson’s. They either have Parkinson’s, provide care to someone with Parkinson’s, or have a family or close friend affected by Parkinson’s. There are currently 70,000 people with Parkinson’s in Australia – each has at least 10 people directly impacted by their condition. Among those donning their active wear for the Walk will be Ros Cassidy, who has utilised the support services of the Parkinson’s organisation in her state since her diagnosis of the condition in 2006. Ms Cassidy says taking part in A Walk in the Park is the least she can do to show her appreciation to an organisation that relies on donations and awareness to continue providing valuable support and services to people with Parkinson’s, carers, family and friends. “It’s a great day out and an inclusive community event which focuses on what you can do, not what you can’t do,” she says. Ms Cassidy has taken part in the event with family and friends since its inception many years ago. “My mother-in-law walked with me for the first year, but now she’s in her early nineties she prefers to watch or take part in other activities available on the day,” she adds. Sydney Olympic Park - as well as the popular 4km walk, 4km run and 7km run, this year Parkinson's NSW has partnered with Athletics NSW to include the Sydney Half Marathon to the event. Wollongong Stuart Park - a 5km run and 2km walk. Melbourne, Federation Square – a leisurely 4km walk along the banks of the picturesque Yarra River. Adelaide, Bonython Park – if you don’t feel like doing the walk, spend a fun family day with the Parkinson’s community enjoying a bacon and egg breakfast, coffee cart, cupcake stand, massages, balloons, face painting, sausage sizzle lunch and information stalls. Perth, Perry Lakes Reserve - participate in the leisurely, non-competitive 2km or 5 km walk or join the more energetic for a 5km or 10km timed run. Perry Lakes will be the hub for pre and post event activities with live music, free entertainment, food and drink and plenty of fun for young and old. For further details of the event in your state and to register, visit parkinsonswalk.com.au.